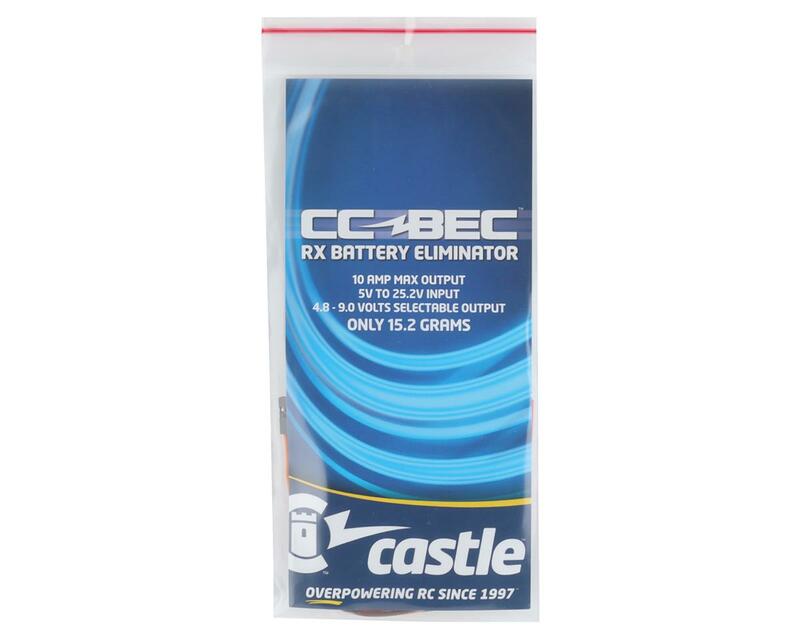 This is the Castle Creations CCBEC, 10 Amp Adjustable BEC. The CC BEC is a little device that eliminates the need for a receiver and servo battery pack. It draws higher voltage from the motor batteries and drops it to a voltage level that is suitable for your receiver and servos. This is required in applications which draw high power for multiple servos or use more than 3S motor packs, as most ESCs with linear BECs are not designed for these applications. Output Voltage: 5.1V - User may set output voltage from 4.8 to 9 using the Castle Link (sold separately). * Ratings are determined with a 5mph airflow on the BEC. Servo connectors are not rated for current in excess of 5 amps. Users are encouraged to replace the connectors if more than 5 amp currents are anticipated. 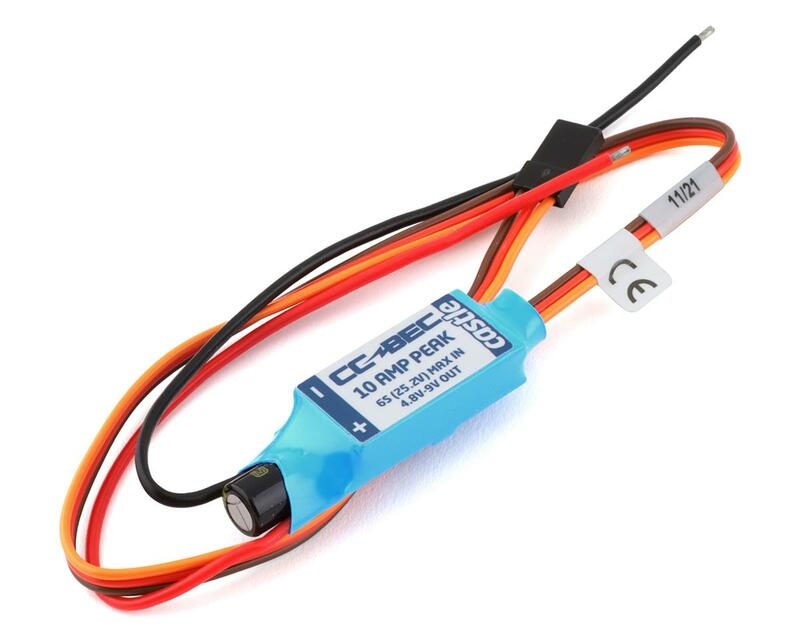 I bought this BEC to bypass my Hobbywing SCT PRO ESC. The power from the HW ESC is a static 6v @ 3amps, and that just isn't enough to power high voltage steering servos like the (Futaba HV9352) when running 2S packs for an 8 minute heat. I cost me a couple races due to my steering becoming mushy past half pack drain which ultimately resulted in wide turns that killed my pace. All the problems are now gone and I can take extra pride in knowing that I reduced the load and internal resistance on the ESC at the same time! If you have steering problems, this is the way to go. Forget about glitch busters, this is your ticket! I am running the stock Traxxas 2075 servo in my 2008 50mph Slash. It works great in this application - servo is much faster & stronger with full voltage going to it. Set the voltage to 6v and it is 6v @ BEC's solder joints and 5.94v @ plug for the receiver. So the voltage loss is due to stock wire length. I don't know if it's suppose to be water resistant/proof, but it did take a complete submersion in the local creek with 2S 6.6Ah Li-Po attached. It was in the creek for about 1.5 minutes before I could get to it, and unplug the battery. Blew out the BEC and everything else with out with the air compressor. That was two weeks and about 10 full batteries ago - Still working great. ALSO, the description states that the BEC is at rating with 5mph wind on it. After many temp checks, I have never found it warmer than the outside temperature, so I am thinking about putting it in its own waterproof receiver box. This works great in electric applications where the BEC in your ESC isn't powerful enough or if your using a crummy Spektrum receiver and get "brown out". However, it is NOT enough for a nitro car with 2 high-end servos, like Savox. I have and OFNA DM-1 Spec and just converted it to LIPO rx and run a Savox 1258tg and a Savox 1283sg and it browns out my Airtronics RX461 (telemetry) receiver. I put a LRP BEC stabilizer on it and that seemed to fix the issue as long as I am not holding full brake and turning the wheels left-right extremely fast (which is never). I am probably going to switch my set-up to the newer Castle pro BEC bc it doubles the amperage and should fix it altogether. All in all this is a very nice set up and works well in MOST applications. Nothing is perfect, and its very small and easy to install. I will also add that it seems to put out a lot of RF noise as my range in my transmitter has dropped significantly. Now I never drive it crazy far away from me, but if its more than 250-300ft away it sometimes cuts out. So mount it somewhere other than inside the receiver box. Enjoy. Have 3 pcs in different applications for number of years. Flawless. I bought this bec so I could run a 2s lipo receiver battery in my nitro truck. Needed something to step down the voltage and I liked that by using a bec I can adjust the voltage rather than using a fixed 6v voltage regulator. Checked the voltage with a volt meter and it is accurate. Was experiencing receiver brown outs due to my Savox steering servo but I added a capacitor and the problem went away. Great product, works well, priced right. i bought this BEC for my Savage Flux HD. i connected caslte link and programmed setup at 7.2V for my HV Servo. i checked voltage just in case before connecting receiver. but the out voltage is 7.6v. i tried serveral time. but voltage didn't change to what i wished. so i change the strategy. i hooked up 3 cell lipo. then finally it came out with 7.2v. i think the reliability is little low in despite of Castle's name value. i rather buy another one or expensive one like ccbec pro. I don't recommend this bec for 6 cells lipo. this bec was blown up today.